It can be a way to introduce new people to your products and services. It can be a way to continue to build strong relationships with your audience. It can be a great outlet for sharing your knowledge. When it comes to blogging, we are all on board. With that being said, it’s one of the few things that you shouldn’t just jump into right away without understanding the ins and outs. I say that with a bit of hesitation because sometimes you can spend way too much time trying to get everything right. That blog you were supposed to launch March 1st still hasn’t been launched on September 1st simply because you are wanting to make sure you got everything just right. In this post, I want to share with you some of the basic do and don’ts of blogging that you should follow. If you’re a blogging expert then you’ll look at this list and think it is common sense, but a lot of this stuff is missed by new bloggers and veteran bloggers alike. There are a lot of things that you can do right with blogging. I like starting off on a positive foot so let’s begin with those. You can focus on everything else under the sun, but if your content isn’t able to draw people in and keep them around then it just won’t work. You can’t drive a car with no engine. The best type of content is the type that is helpful and actionable. People are constantly looking to become better versions of themselves so if you can write content that is actionable and gives your audience something when they walk away from it, then you’ve done something good. Most importantly you need to make the content your own. We work with bloggers that often understand the type of content that they need to write, but for some reason aren’t able to convey their voice and personality in that content. Don’t hesitate to open yourself up. Your brand is you and you want your audience to connect with you. Obstacle.co’s audience is appreciative of my writing because it feels genuine. The blog is in an industry where people experience lots of scams and shady individuals so it was important for me to come across as human and someone that is truly trying to help others. One of the myths that bloggers come up with is that their audience doesn’t like long content just because they don’t like long content. The people you are trying to attract will love the long content your post as long as it helps them solve a problem. Nothing is worse than someone coming to your site hoping to find the answer and they have to leave because your post didn’t do a good job of covering it. Not everybody likes long content, but the people that are going to pay you money will love it. If you want to know more about writing great content then check out how to write a powerful blog post. This is where a lot of people get hung up. Do you write every single day? Is it okay to only post a couple times a month? The answer to both questions is yes. It is completely up to you. You might have another job besides blogging so writing every single day isn’t an option, but you can’t grow your audience without new content so you do need to write. Come up with a publishing schedule and stick with. The reason why many blogging experts say that you should post every single day is because the more content you have, the wider the net you are casting to attract an audience. I agree with this, but only if you can write top notch content every single day. Promoting the two posts you write monthly is just as important as writing so don’t think that magic will happen just because you are writing frequently. You want to be consistent with your posting because your audience expects it. If you binge write for two months and then disappear for three months your audience will forget about you and you have to start all over again trying to reconnect with them. Obstacle.co has a less frequent posting schedule than some of my other blogs simply because it can be harder to put together the right content for this audience. On one of my health blogs for example, I could easily do a post a day because the posts don’t have to go into as much detail. Find a rhythm and stick with it. When we launched Thrive/Strive people questioned why we would launch a blog in such a crowded market. Crowded markets just mean that someone else has done the audience research for you already. A professional design goes a long way in making people believe that you’ve been doing this for years. When people come to your site does your design make them believe you know what you are talking about? If not, then you have to try that much harder to convince them. It’s like you see me at a restaurant ordering 5 bottles of the most expensive wine and you end up thinking that I must be pretty important just on that fact alone. There are so many blogs out there that people don’t need to spend time on a design that gives them a headache. Just because you see other blogs with terrible designs succeed doesn’t mean you should try and go that route. Increase your chances of success with a strong design. Building relationships with other bloggers is one of the most important things you can do for your blog. It’s not even an argument. Sure you can try to ride the wave alone, but you look so much cooler with a boat pulling you along. That boat is the blog community you are a part of. When you build relationships with other bloggers you are giving yourself a chance to get in front of their audience. Do you want to spend two years trying to build your email list to 50,000 subscribers or spend 2 months connecting with people that have a collective audience of 100,000? What you shouldn’t do when trying to connect with other bloggers is ask for them to help you right away. They have enough people begging for attention and wanting some publicity. Instead, find some way that you can help them out. You don’t make friends by asking them for money before you know their names. Your audience doesn’t come to your blog to feel sad or angry. Do your best to keep your blog positive. Not fake happy positive, just positive. You can keep things real without sounding mean or harsh. If you are having a bad day then you might not want to touch your blog. Let things settle down and then jump right back in it. There are exceptions to this depending on your blog’s topic and audience. I think I’m a good writer, but I’m a terrible editor. I miss grammatical errors and misspellings and that doesn’t reflect very well on me. Thankfully, there are tools out there that can help you with your first couple of passes. Grammarly is the tool I hands down recommend to every blogger. It’s both a browser extension and desktop application so no matter where you decide to write your posts you are in good hands. It won’t make your blog post captivating, but it will catch those silly errors that sometimes fall through the cracks. Your blog isn’t Wikipedia so don’t act like it is. Instead, pretend that you and your reader are sitting on a nice patio and you are teaching them something. Every successful blog is able to build a connection with their audience. This can be hard to do if your tone is cold and distant. You want the reader to feel like there is another human being on the other side of the screen. Some bloggers are stingy and only like to link to their own content. There is a ridiculous amount of great content out there being written by other bloggers. Remember when we talked about building relationships with other bloggers? Bloggers love nothing more than being linked by other bloggers. It sends traffic their way, increases their Google juice, and lets them know that they wrote something that other bloggers find useful. The truth of the matter is that most people that come to your blog won’t read all of your content. Most will leave right away because people are strange folk, but there is another subset of your audience that will quickly scan your article trying to pick up important points. If your content is nothing but the same font then nothing will stand out. Headings help provide a summary for people that are scanning your post. It helps them decide if it is worth their time to scroll back up to the top and read the post in its entirety or skip town to another blog. It’s intimidating seeing a giant wall of text. When people say they don’t like reading long posts what they usually mean is that they don’t want to feel like they are reading long posts. You need to break up your posts so that your readers are given little breaks. Throw these in at different points in your post and it makes it a lot easier to read. Whether you know it or not, your goal is to write the best blog in your niche. It might not happen on day one, but you need to make that a goal. That means that you always pick quality over quantity. It doesn’t help if you’re writing 5 posts a week if nobody cares about them. You want to write posts that people bookmark, share, and continue to come back to even when you’ve moved on to the next post. There is enough trash on the web and people try their best to avoid it. There is no reason for you to contribute to it. I like to call this cultivating your tribe. Your tribe is your audience. It’s the people that were put here to read your blog. What many bloggers fail to do is recognize their audience. Instead, they end up writing generic posts that they think apply to everybody. When you try to write for everybody you end up writing for nobody. When you find your tribe and understand what they are looking for your blog will start to grow exponentially. What’s the point in writing a blog if you can’t be yourself? Let your personality shine. Go and read every successful blogger’s blog (not those giant media blog with 1,000 different writers). What you will find is that each one of them is unique because of the blogger’s personality. If you can’t let your personality shine in your writing then you might want to consider becoming an editor for Wikipedia. Alright, here we go. There are definitely things that you should avoid when blogging. It’s no secret that I steal ideas from other bloggers. I see what a blogger wrote and if I feel I can write a better version then I will do it. Brian Dean calls it the Skyscraper Technique. If someone writes a post about the 21 best headlines to use for a blog post then I’m going to try and think of 39. I’ve had a blogger write and threaten me with lawyer stuff because I wrote a post with the same blog title as theirs. That was the only similarity. Beyond that, I decided to write 3,500 words of awesomeness while their post was about 800. However, you should never just take a blogger’s post and post it on your blog. Your blog is your own and you should respect the work of other bloggers. We all work hard to build our blogs up and we should try just as hard to help each other out. Not take away from each other. A big mistake beginning bloggers make is thinking they can go to Google, search for something, grab the image, and post it on their blog without any consequences. You can get into some big trouble for this. Thankfully, there are a ton of awesome stock photo sites that you can use. Don’t feel like paying for images? Then use a free stock site aggregator like Libre Stock. All of the images on there are public domain so use them to your heart’s content. If you’re writing a blog to make money you might be hesitant to share your knowledge because you think it should be in a course or book that people will buy. It’s a tough thing to balance, but you should always try to share as much knowledge as possible on your blog. Share almost everything and make people pay for the premium stuff. Looking at this blog post, even though we went over 15 different dos and don’ts of blogging, there are some points in which I could dive into much more detail. For example, finding your tribe or writing great content. Those things are subjects that deserve their own books. Look, there is no right or wrong way to blog. Some ways definitely work better than others but there just isn’t a perfect manual. However, all successful bloggers do have things in common and all of the points you read above follow them. If you’re curous about how to generate more traffic to your blog then check out my super guide to gaining more blog traffic. 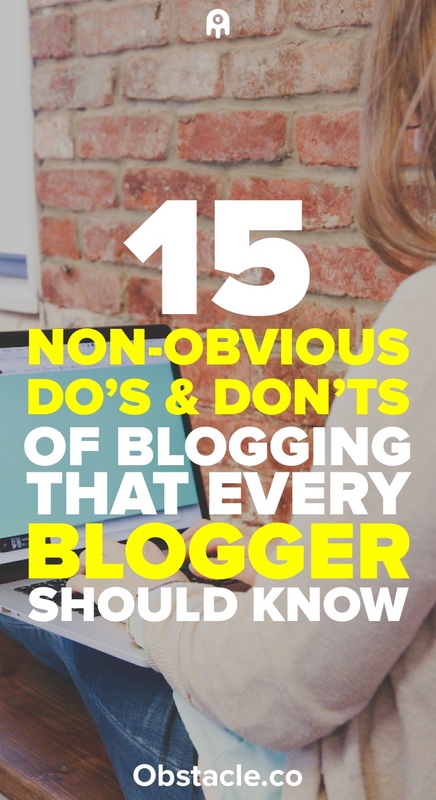 You don’t get what you don’t ask for so I’m asking you to take a second to share 15 Non-Obvious Do’s and Don’ts of Blogging That Every Blogger Should Follow with your audience. They respect great content.